I just finished reading another Barbara O’Connor novel to my children. We were quickly hooked. 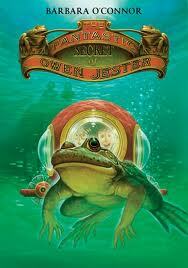 The Fantastic Secret of Owen Jester is an ideal summer read – all about having time on your hands and deep woods, mucky ponds and fantastic secrets to explore. We worried about Tooley the big green bullfrog who just seemed too sad. We were delightfully irritated by Viola and her know it all ways (and also impressed by what she did actually know!) And we rooted for Owen and his plans for the very special and mysterious item he heard tumble (tumble, tumble, tumble) off the train. Small town Carter Georgia. Big days of summer. Life lessons to learn. We love the endearing characters and simple days described in Barbara O’Connor’s novels. This entry was posted in Uncategorized and tagged Barbara O'Connor, fiction, friendship, frogs, great read alouds, novels by carriegelson. Bookmark the permalink. I’m so glad you all enjoyed it!! Thanks. I couldn’t agree more about this book. As a former school librarian, I recognize that we need all kinds of books for kids, and Barbara writes lots that they love to read–for fun! This one’s a perfect adventure for summer time. Augusta – I loved When You Reach Me. (and just posted my thoughts) I also read your review for the CSM and see that you did too!